This page contains GN cabooses of uncertain number/origin. CLICK HERE for GN Cabooses in the X-301 to X-757 group. 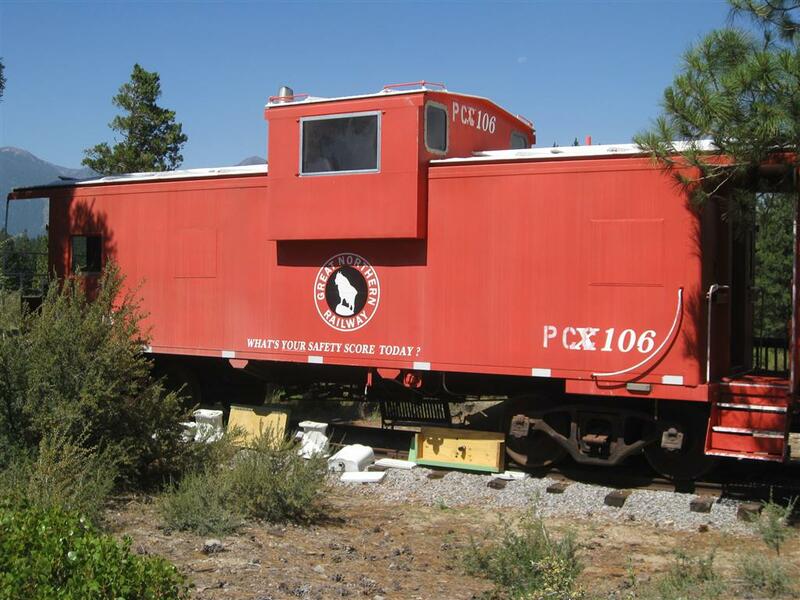 Masquerading as GN X-106, BN caboose 10772 (built for BN 1973) is located on private property near Weed, CA. 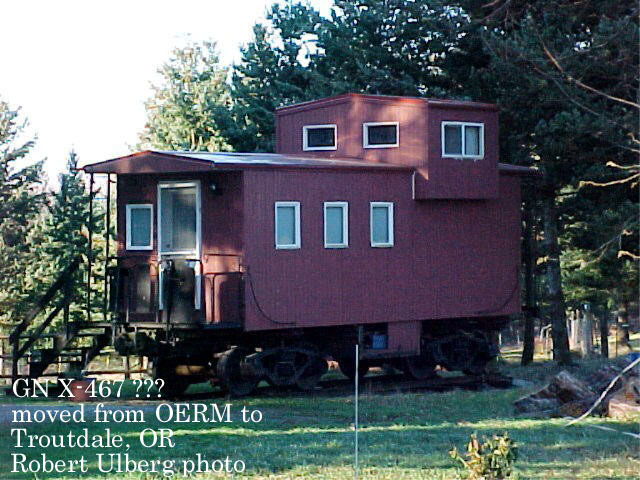 The "PCC" on the side, stands for "Palouse (WA) Chamber of Commerce" where this caboose was originally located. July 2012 photos by Lindsay Korst. 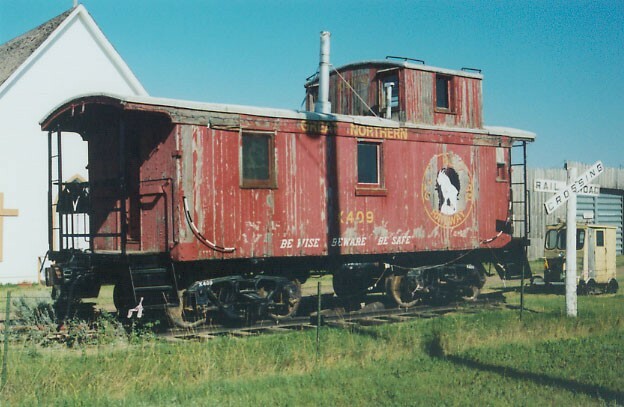 Masquerading as GN X-485, this caboose sits behind a school in Havre, MT. July 2005 photo by Steve Hutcheson. BN 12562 is possible rebuilt GN caboose per Ben Ringnalda. 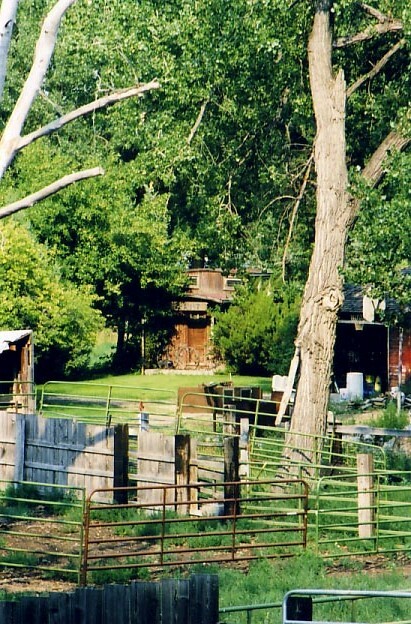 Photo taken on our joint trip at Naples, ID, July 2004 by Lindsay Korst. Update: According to Roger Kirkpatrick, this is GN X-123/BN 10083/BN 12562. Masquerading as a GN caboose is this ex-CB&Q waycar per Ben Ringnalda. Photo taken on our joint trip near Priest Lake, ID, July 2004 by Lindsay Korst. 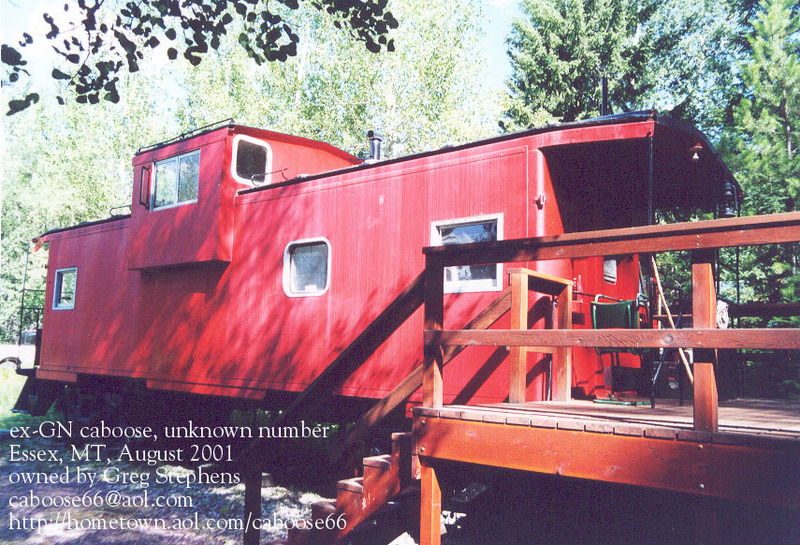 This unknown GN caboose (formerly the Seattle Terry Ave. caboose?) is lettered TAFH 315 and can be found in the collection of the Washington State Railroads Historical Society at Pasco, WA. Photo taken in October 2003 by Lindsay Korst. 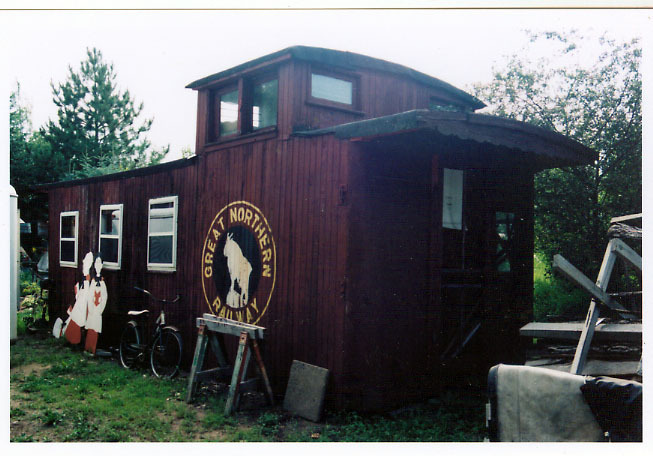 This unknown GN caboose is minus its trucks and is located north of Aitkin, MN on US 169. It appears to be a 25' wooden caboose. 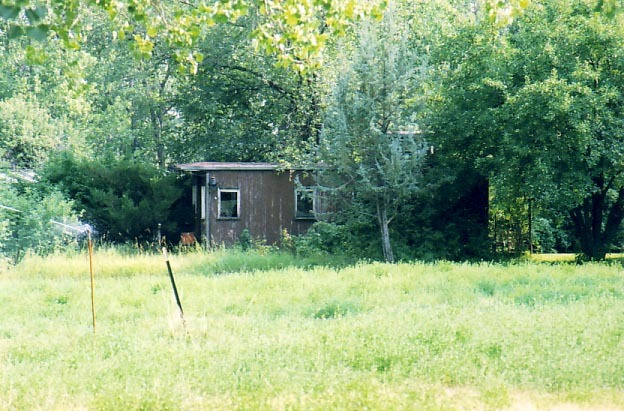 Photo taken in July 2003 by Lindsay Korst. 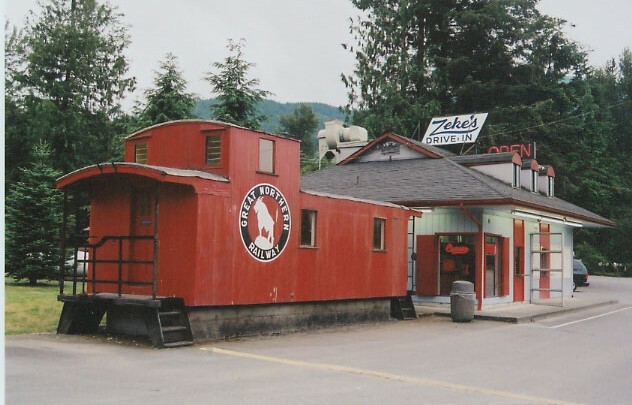 This unknown NP caboose minus trucks and painted up in a GN scheme has long been a fixture at Zeke's Drive In, just east of Gold Bar, WA. Photo taken in June 2003 by Lindsay Korst. 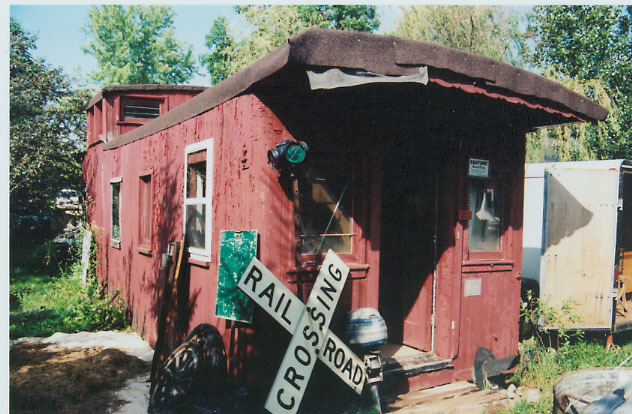 Located at Essex, MT is a former GN caboose owned by Greg Stephens. Greg is unsure of the exact number of this caboose, but thinks it is GN (does anyone out there know its origin?). Greg has a website which tells more about his caboose. Photo taken in August 2001 by Lindsay Korst. Update November 2006: According to Roger Kirkpatrick, the above caboose at Essex is BN 12137 built in March 1977 for Burlington Northern. 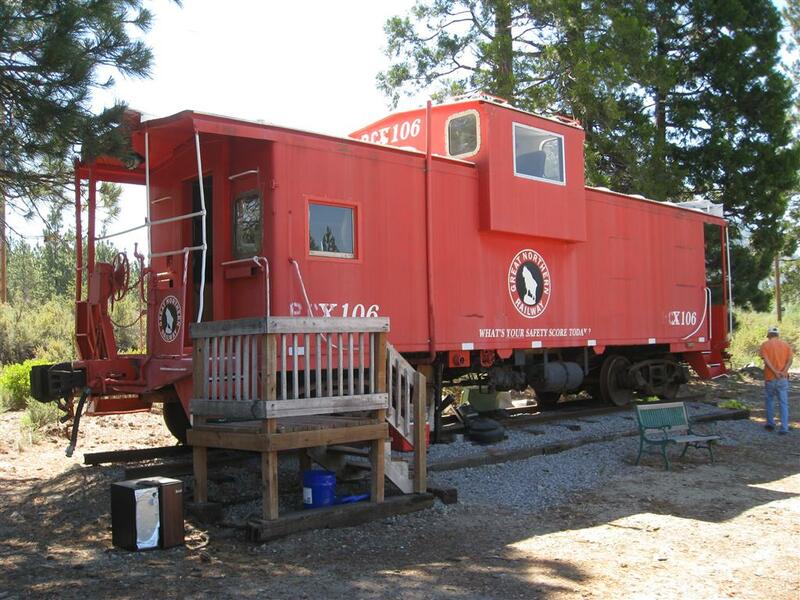 Painted as X-97, this caboose is one of 4 available for rental at the Izaak Walton Inn in Essex, Montana. The cabooses are painted in the schemes of GN, BN, MRL and CB&Q. This is NOT an original GN caboose (ex-BN 10571), but they did such a nice job on the paint scheme, I couldn't resist. Photo by Lindsay Korst in July, 1998. This ex-Northern Pacific caboose is painted up as GN X-409 and is located at Scobey, MT. April 2003 photo from Ron Gebhardt. Update: As the paint has begun to peel, you can clearly see the words "Main Street Of The Northwest" on this bogus GN, actual NP caboose at Scobey, MT. July 2003 photo by Lindsay Korst. 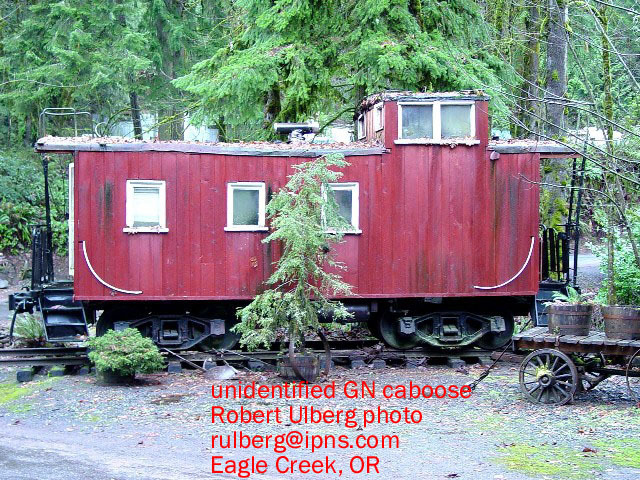 Unidentified GN caboose at Sumpter, OR. Photo taken May 2002 by Robert Ulberg. 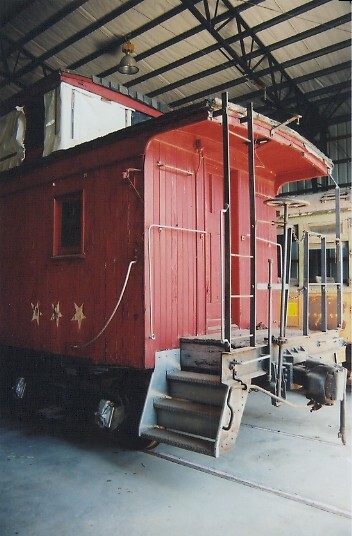 Click Here for more info on this caboose. 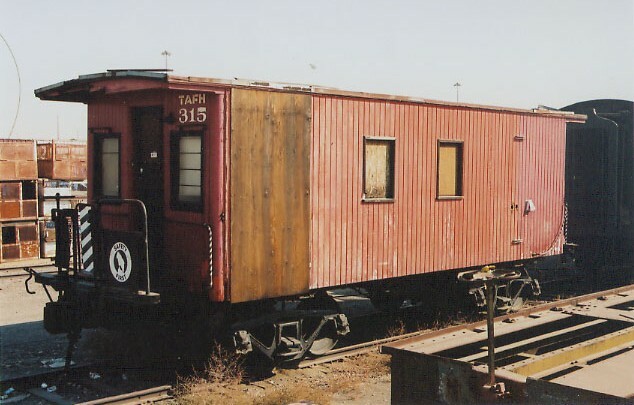 Update 12/14/2002: According to Roger Kirkpatrick and Robert Ulberg, this caboose might be the ex-GN X223. 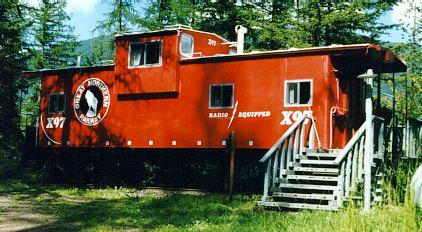 Located at Oregon Electric Railway Museum in Brooks, OR, this is possibly the X-467. Many thanks to Jack Norton of OERM who opened the car barn to let me take a look. Photo taken in July 2002 by Lindsay Korst. to trace its history and we have discovered 2 possibilities. from SP&S that was transferred from the GN in 1910.
or a built in toilet. 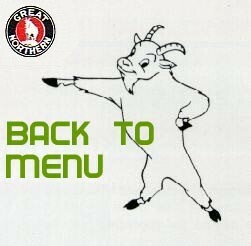 Can you help us in this search? common, compare the photos and one finds too many differences. GN lengthened to 25 feet and converted to 25 feet length. organization have any info on the rebuilt program of 1909? a steel underframe and trucks with GN parts. Update 12/14/2002: According to Roger Kirkpatrick and Robert Ulberg, THIS is the actual X-467 moved from OERM to Troutdale, OR. 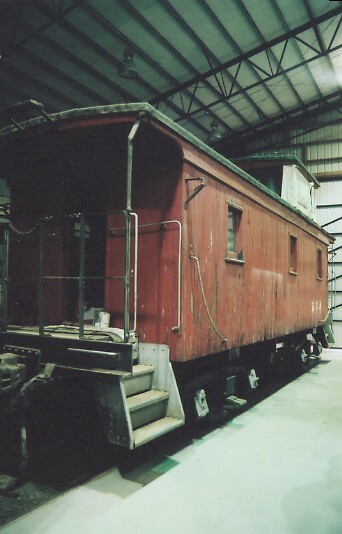 Thus the X-467 shown above in the OERM car barn remains unidentified. 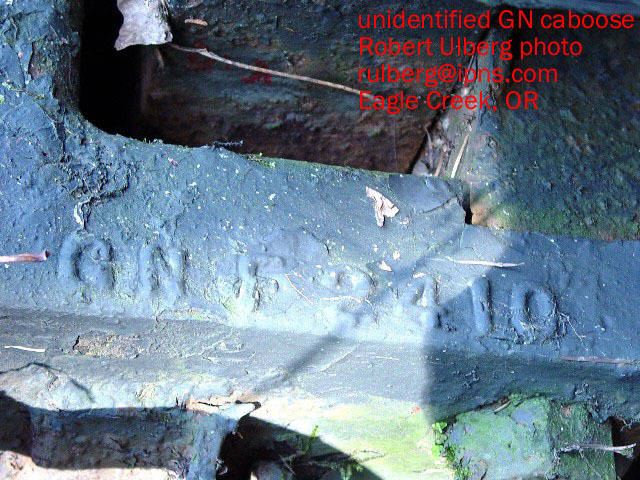 Unidentified GN caboose located in Eagle Creek, OR. Photos taken by Robert Ulberg. Painted red with a GN logo but no other markings, this caboose is located in Pullman, WA. Photo taken by Robert Ulberg. 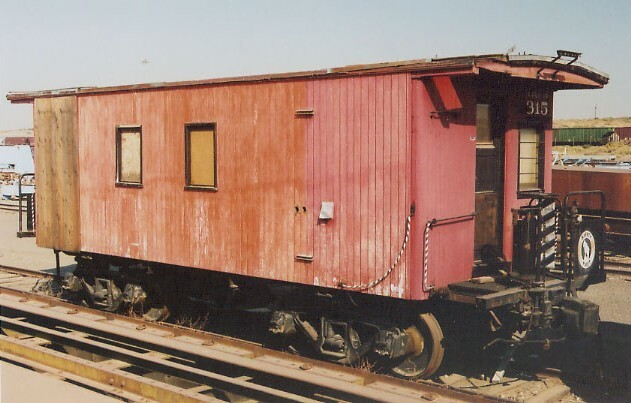 Update: Jack Porzig has identified this caboose as BN 12182 built for BN in July 1982. 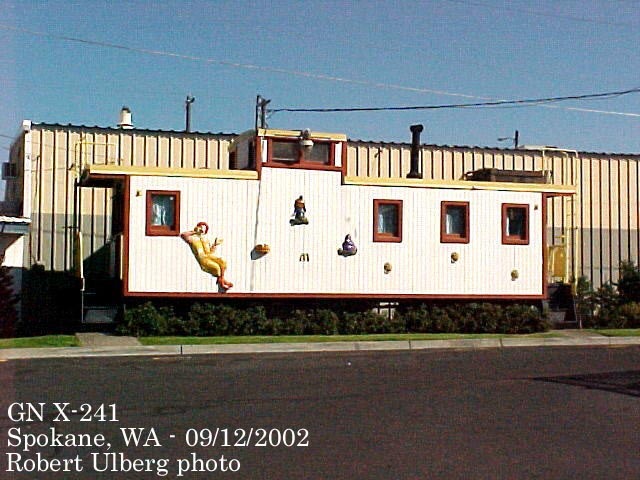 X-241 - Located in Spokane, WA (3416 N. Market St.), this caboose picture comes courtesy of Robert Ulberg who photographed it September 12, 2002. Update 8/23/2003: According to Roger Kirkpatrick, this is NOT the X-241 (which is in Canada). X-??? 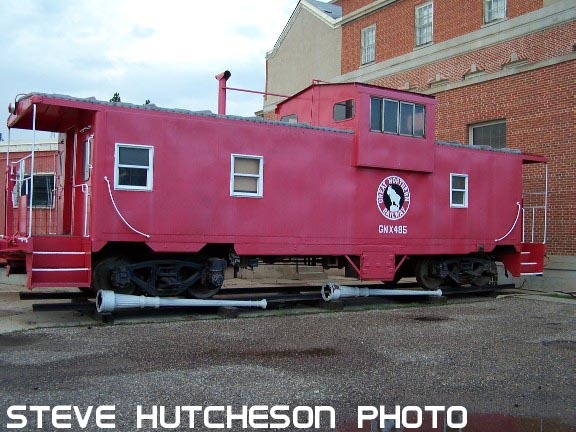 - Located at North Havre is this unknown GN caboose on private property.